New studies show that Tai Chi beats strength training and aerobics for preventing falls among seniors. These studies showed a reduction of 30% in falls, when compared to other modalities. The article, by Dennis Thompson, was published in the San Diego Union Tribune 4/9/19 edition. The article indicated that the practice of moving in different directions promoted positive postural responses. This resulted in the improved ability to retain balance. The original study was published last fall in the journal JAMA Internal Medicine. Tai Chi is a centuries-old Chinese tradition that involves a series of graceful movements to boost health and energy. The practice of Tai Chi can be performed by anyone. You can learn this from martial arts studios. In Poway, there are classes offered through Poway Adult Education. Best for Weight Loss – Dieting or Exercise? New studies by evolutionary anthropologists show that our metabolism is largely fixed. Over the long-term, the amount of energy our bodies burn per day is pretty consistent regardless of activity level. When you exercise more, the body simply lowers the calories required for other activities. This shows why severe exercise may not be the best way to lose weight. While exercise has a place in maintaining skeletal integrity and heart health, diet may be the way to go for weight loss. Here diet does not mean starvation or fasting, but making simple changes. These changes include: portion control, eating more “live” food and less “fake” food, and even simply eating slower and with purpose. As 2018 comes to a close, I wish everyone a Merry Christmas and Happy Holiday period. As 2019 begins, it is never too early to begin making positive changes in all aspects of your life. These changes will impact not only you, but also your family and friends. No one will take better care of you than yourself. Make the investment in yourself, restore your health naturally. 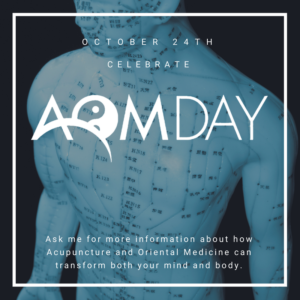 Acupuncture and Oriental Medicine Day, October 24, 2018. Help spread the word. RESOLVING YOUR STRESS – PROTECT YOUR MENTAL QI. People think of “Qi” as an invisible mystery energy. I believe this was a mis-translation, as the symbol for qi means rice vapor, which can be thought of as oxygen. This is the physical aspect of Qi and relates to our levels of oxygen or energy in the body. On a mental aspect, we also have Qi, which is our thoughts, interests and mental beliefs. How can we control stress, by protecting our mental Qi? For example, if someone illegally detained us in jail, we would shout out loud at the injustice. However if someone or something does this with our mental Qi, by absorbing our thoughts and inducing stress, we just try to bear it silently. Over time, studies show this is very harmful for our health. Think about those things that you have no control over, try to let them go so that they do not absorb your mental Qi – they do not clutter your mind. This way you can use your mental energies for those things that you can control and hopefully live a more peaceful life. Remember, life is full of stress. You cannot control the stress, but you can control your reaction to it. Since 1996, we've helped THOUSANDS of local patients.